The Cornilleau Tacteo 50 composite is a durable and waterproof table tennis bat designed for recreational outdoor play. It is resistant to shock and UV rays and features an ergonomic flared handle for a comfortable grip, as well as special Skin+ covering for increased control. The bat offers a solid injected polymer blade and can be regularly washed using soapy water. 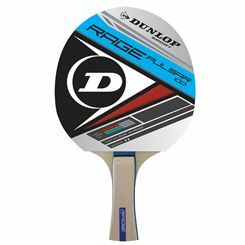 The Dunlop Rage Pulsar table tennis bat is suited to beginners and has a flared handle which increases comfort and helps with shot control. 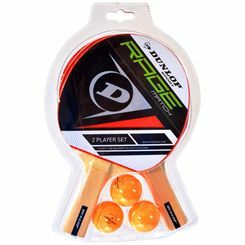 The 5 ply blade is 6mm (0.23") thick and encourages enjoyable play for those just starting out or playing for fun. 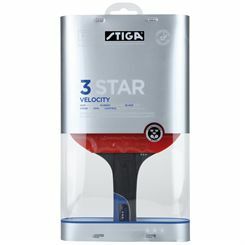 The Stiga 5 Star Carbo Advance table tennis bat uses Crystal technology for increased speed and is designed with pro players in mind. 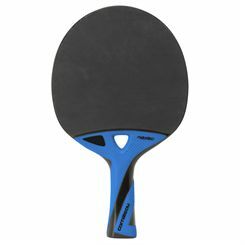 It features ITTF (International Table Tennis Federation) approved rubber and a 7-ply blade. Great for offensive players, the bat ensures explosive power and maximum spin. 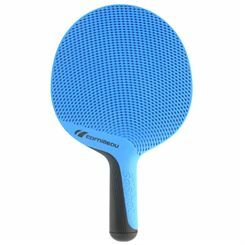 It guarantees a reduced risk of slipping out of hand while playing thanks to a concave handle. 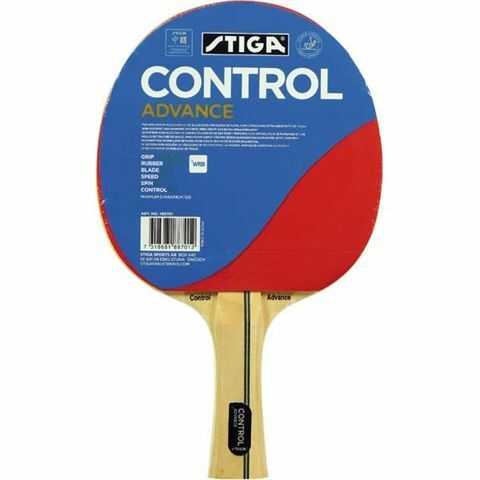 Stay in control of your game with the Stiga Control Advance table tennis bat. This high-quality bat is best suited to recreational players and game improvers and has been made using WRB system ensuring added power, faster returns and a great touch. 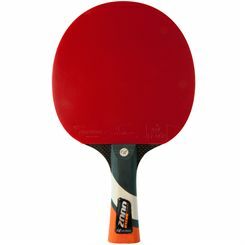 It is suitable for an all-round game and features a 5-ply blade and a concave handle for a firm and comfortable hold. 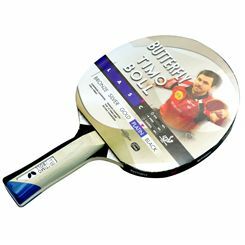 The bat offers a smooth surface on both sides and it is approved by the ITTF (International Tennis Table Federation). Who would have expected an after-dinner amusement amongst the gentry to develop into a much-respected Olympic sport in the space of a century? Table tennis did so, but the game played in the 1880s would not much resemble the now widely played international sport. It is thought that the origins of the game date back to Victorian dinner parties where, once the dishes had been cleared away, books were brought out to make a net and also used as a hitting device for discarded champagne corks or golf balls. The concept may have been adapted from versions developed in India or South Africa by British soldiers who then introduced it back home. It caught on quickly, and popularity soared around the turn of the century as it was a very accessible game; most households would have had the necessary table, books and something to act as a ball. Sometimes the lids from cigar boxes served as rackets before special equipment was later designed and mass-produced. 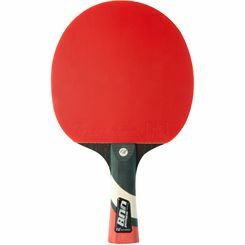 The game became known colloquially as “ping-pong” and “wiff-waff” because of the noise made when using a piece of wood with parchment attached to the head of a primitive racket. The name “ping-pong” was trademarked by J. Jaques & Son Ltd in Britain and by The Parker Brothers in the USA, so the term table tennis was principally adopted. 1901 saw a number of breakthroughs in the development of the sport. Celluloid balls were used for playing and then rubber was employed to cover wooden racket heads, and the modern sport started to take shape. Twenty years later the Table Tennis Association was created in Britain, and in 1926 The International Table Tennis Federation was founded. That same year, London played host to the inaugural World Championships, the first officially held table tennis tournament. Sponge was placed between the layers of rubber and wood in the 1950s, which had a drastic effect on spin and speed in the game. The sport debuted at the inaugural Paralympics in 1960. In 1988 the sport’s status gained a big boost by being included in the Olympic Games for the first time, and it has remained a Games sport ever since. On South Korean soil in 1988, the hosts and China won 9 out of the 12 available medals in the men’s and women’s singles and doubles competitions. China remains the dominant force in Olympic table tennis, having won 47 medals since 1988 with nearest rival South Korea having won just 18. In 2008 China took a clean sweep in the singles medals and won both team golds as well. Its popularity in Asia gives the sport one of the highest numbers of players worldwide. A number of rules changes have been introduced over the last 20 years in order to slow the game down to make it more visible for television audiences. 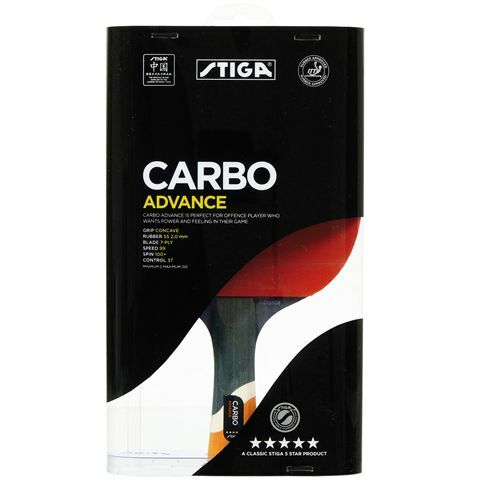 However, this has not stopped technological advances from influencing the game, with carbon-fibre, aluminium and Kevlar used in the production of the highest quality rackets. 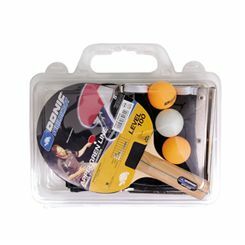 The basic equipment needed to get started consists of a bat, a ball and a playing surface, ideally of standard sized and wooden with a material net. Bats and balls can be purchased very cheaply and in sets, although better quality rackets which will help with gameplay will be more costly. Investing in a table might be too much for recreational players, but there are many other ways to play properly: local clubs, sport and fitness centres, community centres, concrete tables in parks, and even in bars and pubs. The advantages of playing go beyond just amusement. The intense and fast-paced nature of the non-contact game mean you can get a cardiovascular workout with a low risk of injury. A fun fact is that the sport was banned in Russia during the early 20th century because it was believed that the sport was dangerous for people’s eyes. 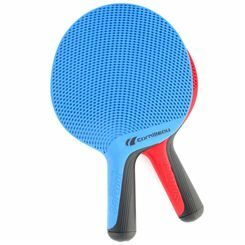 Table tennis bats have developed a long way since books, boxes and wooden handles were first used to strike golf balls across Victorian tables. A wide variety of types of bats exist, from the most basic beginner ones to professional grade rackets, but they all share many common characteristics. It is worth noting that there are many names for the same piece of equipment, with rackets, paddles or bats often interchanged freely. 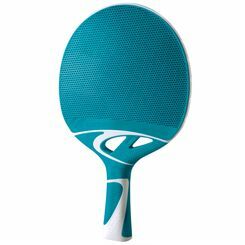 According to the official laws of the game, the racket can be any size, shape or weight but the blade has to be both flat and rigid. In reality though, most bat blades are approximately 6.5 inches (17 cm) in length and 6 inches (15 cm) wide. 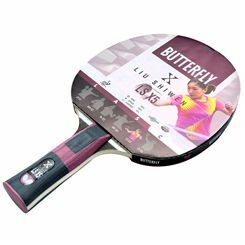 Making your racket much larger might increase the chances of hitting the ball but it will make it heavier, less aerodynamically efficient and more difficult to manoeuvre. Rackets must be made from at least 85% natural wood, with other materials not making up more than 7.5% of the total thickness or 0.35mm, depending on which figure is smaller. Materials used commonly to enhance competition rackets include carbon fibre, Kevlar and aluminium. The bats have two main parts: the blade which is for hitting the ball, and the handle. The wooden blade is covered with a base sponge material and then a rubber surface which may or may not be pimpled. Having different styles of rubber covering on the opposing sides of the bat is permissible, and this enables players to play a more varied game, with one side for spin and another for power or defensive play. However, one side must be black and the other red. The huge choice of rackets on the market can seem daunting at first, nevertheless once you work through certain filters and eliminate unsuitable bats then finding the right one will become a much easier task. • Know your level and aims – are you a recreational player, a club player looking to improve or a serious competitor? This will influence which racket will be best for you and probably your budget too. A high-quality, £200 bat would be unnecessary for a beginner or occasional player, and similarly the most basic racket may hamper the development of a competition player. • Know your style of play – thicker sponges are better for offensive players and thinner ones for defensive players. • Do you use spin or want to counteract it? 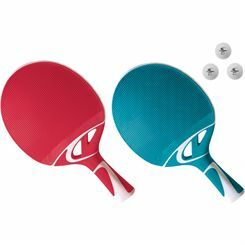 – Different rubbers offer more or less spin, power and control, and some can help to nullify your opponent’s spin. • Pimpled or smooth – smooth blades allow all types of shots to be played with better control, whereas pimpled ones are better for fast attacking play and generally reserved for more advanced players. As with all equipment, it must be looked after carefully to increase its lifespan and mitigate the deterioration of the rubber and general wear and tear. To this effect it is worth buying a bat cover to protect your racket. Covers will help to shield your racket from dust, dirt and light, and more advanced ones will reduce the negative effects of air and extreme temperatures.